"A deep ruby red strong ale with an excellent balance of malt sweetness and hop bitterness. 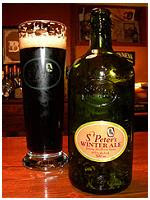 A classic example of a ‘winter warmer’; high in alcohol and rich in taste." This ale pours a deep burnt red colour. It has a two finger off white head that dissipates fast. The aroma is malty and yeasty. Not overly complex, I do smell a hint of alcohol as well. This is a sweet ale with lots of malt up front. I also detect a little coffee and milk chocolate. The alcohol does not come through in the taste. This has an extremely smooth mouth feel with a medium body. My overall impression of this ale is excellent! It is not overly complex however it is very well balanced and extremely smooth. This one is very easy to drink. With all the other top quality beers that St Peter's has this is no surprise. I would rate this ale a 8.5 out of 10. Posted in: English Strong Ale,Scott,St. Peter's Brewing Co.